What are you currently using to measure the moisture content or wax coating thickness in your corrugated product? In the corrugating industry, controlling product moisture levels is critical to the manufacturing process. Moisture content has a drastic effect on quality and can lead to problems with warping, glue adhesion, and printability. Measuring the moisture at linear, medium, and face locations will yield significant improvements to the finished product. MoistTech has developed the IR3000 Moisture Analyzer for corrugated board. This first ever “Smart” sensor is unsurpassed in performance and reliability, and provides the ability to control the process with an accuracy of +/-0 .1% moisture. In board plants, the sensor is often installed in extreme heat locations typically near a pre-heater. In these situations, the gauge is fitted with a built-in Vortex Air Cooling System to optimize performance and extend the life of the instrument. Furthermore, the environment in board plants can be very moist so IR3000 comes standard with an air-diffuser nozzle which prevents condensation from collecting on the sensor’s optical window. In the corrugating industry, wax coating is often applied to the corrugated product. Having the correct amount of wax or the presence of wax is critical during the manufacturing process. The IR 3000 Moisture Sensor which is ideally suited to measure the amount of wax coating that is being applied to the corrugated product. Thus, corrugators improve their product quality, reduce their wax consumption and improve their cost savings. Unlike other instrumentation of this type, some of the unique features of the IR3000 is that it can monitor the product even with small gaps in product flow and is unaffected by ambient light without impacting the accuracy. The sensor is insensitive to material variations such as particle size, material height & color, our moisture sensors provide continuous, reliable readings with zero maintenance and a one-time calibration with a non-drift optical design allowing operational personnel to confidently make immediate process adjustments based on real-time measurements. By installing the sensor at the exit of the dryer, a manufacturer can continuously monitor the process and can control the moisture content either manually or automatically instantly. If the sensor is susceptible to extreme heat conditions, it is necessary to cool the sensor with either air or water. Typical accuracy is about ±0.1% gsm. Typical analog ranges are from 2-60 gsm. Stability on certain applications is within 0.002 gsm. The outputs can be adjusted to optimize PLC or recording requirements. Learn more about our Thickness Applications here. We can also measure Film Thickness, Hot Melts, Glue and more. 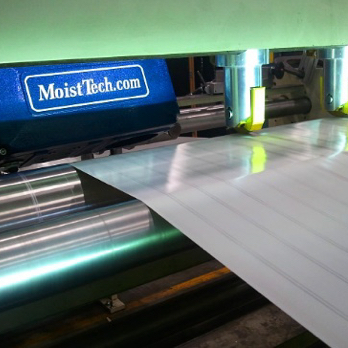 Ask how MoistTech Corp. can help you produce improved products today!